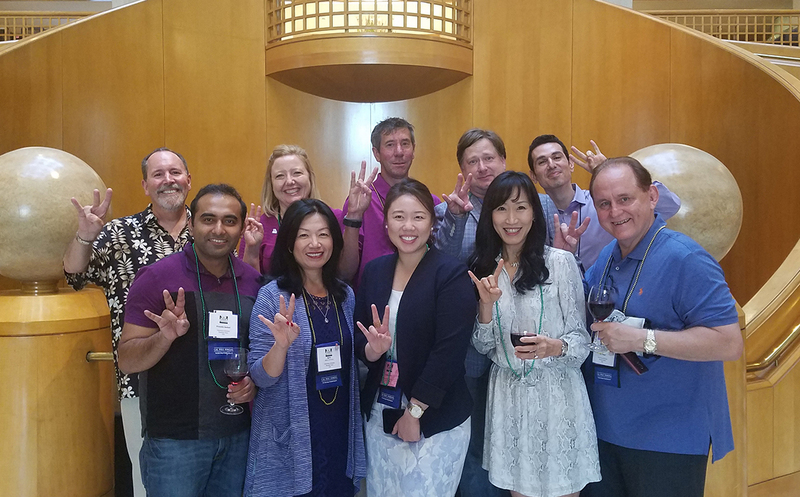 Hilton College was well represented during the International Council on Hotel, Restaurant and Institutional Education (ICHRIE) Annual Conference, held July 25-27 at the Renaissance Esmeralda Indian Wells Resort & Spa in Palm Springs. Our representatives and presenters at the conference included, clockwise from top left, Dean Dennis Reynolds, Associate Dean Mary Dawson, Associate Professors Jason Draper, Chris Taylor, Juan Madera, Professor Carl Boger with wife Sunny, doctoral student Lindsey Lee, Professor Agnes DeFranco, and Associate Professor Priyanko Guchait. Graduate students Anqi Luo and Jookying Kwon are not pictured. As past president of ICHRIE, Dean Reynolds inducted new members to the Board of Directors, including Associate Professor Chris Taylor as director of Research. With this position, Dr. Taylor has the opportunity to shape the future of the organization in terms of research initiatives. This includes working with editors and researchers for the Journal of Hospitality and Tourism Research and the Journal of Hospitality Tourism Education. Previously, Dr. Taylor has served on ICHRIE’s Marketing Committee and has chaired the ICHRIE Teaching Academy. As chair of ICHRIE’s Comprehensive Organizational Review (COR) Committee, Dean Reynolds also presented a cutting-edge strategic plan during the conference. The overarching goal of the review was to identify strategic changes that will lead to a more robust organization, with a particular emphasis on exploring the value the organization delivers to its members. This comprehensive plan, the process of which began with a series of focus groups, was unanimously supported by its Board of Directors. Dean Reynolds was tasked to lead the committee more than a year ago, after holding several positions for ICHRIE – including director of Membership, director of Research, vice president, president, past president, and special advisor to the Executive Committee. He currently serves on the Past Presidents’ Council. “My goal all along has been to give back to the academy through this amazing organization,” he said. “With this plan, the best is yet to come!"